Well this posting is over a year and I dont normally post comments but I'll clearify what these two positions do and who does them. I worked Security there for 5 years people dont understand how much theft actuall goes on at these stores, I'm talking millions of dollars a year. Unfortunately with the amount of people in my line of work we can only scratch the surface on the overall dollar amount. Yes there are a lot of registers and yes for the most part they are only used during Holidays or special sales no big deal. Infact they could probably use a little more. lines there get really crazy. 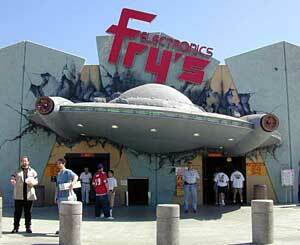 The line monitor or "Vanna" in Fry's lingo is a rotating position with all the cashiers. 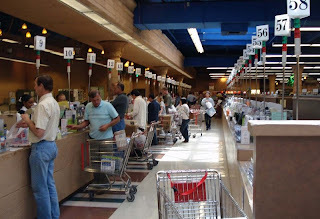 every half hour to an hour the cashiers and sometimes supervisors depending on the time of day will usher the customers to whichever register is open. It may not make sense to most people but it does to them. There is always a reson for certain policies at apparently it works for them. Now, the people at the door when you enter or exit are called Courtesy Associates. They are a part of the Loss Prevention Department. Just like Target has that uniformed douche. He's part of their Loss Prevention Department. The guys at the door ask to see your receipt, not because they dont trust the customers. Its because they are there to in more words or less, detect human error from the cashiers. Cashiers miss ring a lot of people and when ever a mistake is found its delt with by write ups. I use to attend their meetings every week. it's amazing that these people are able to save tens and thousands of dollars a week. So yeah...there is always a purpose for something whether it seems dumb for most people of not. it saves them a lot of money..
Iapologize for my spelling errors. I neglected to proof read before submitting.